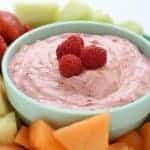 If you are making a fruit tray, you will want to include this Raspberry Dip for dipping. Just 4 ingredients are needed and it is so super simple to make. Great for a summer potluck addition. Beat cream cheese until whipped.